Modern holiday apartments in the middle of beautiful nature, plenty of culture and colorful lifestyle. Welcome to the middle of Eisenach. Welcome to SuitesMITTE. Our apartment house makes it possible for you. The spacious apartments offer room to relax and unwind. Exquisite details, such as design furniture, underfloor heating or oak floorboards complete the comfort concept. Not only are there plenty of doors open in the immediate vicinity when you are looking for culinary joys. The fully equipped kitchens in our holiday apartments invite you to create your own gourmet times. 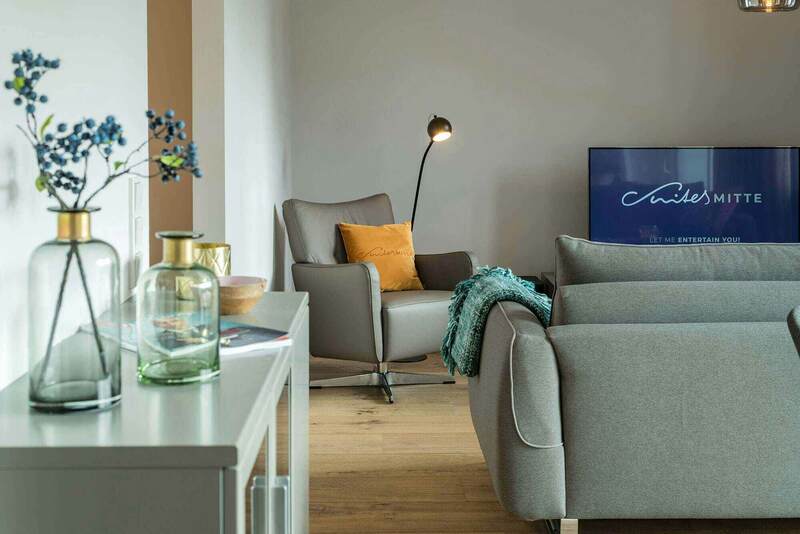 Our high-end and individual apartments are ideally suited for longer stays, regular business trips or for companies who are looking for classy accommodation for their employees. We offer you a warm welcome to our holiday apartments. Enjoy an exquisite living environment designed with loving details and the latest amenities combined with personal independence in one of our eight comfortable apartments. 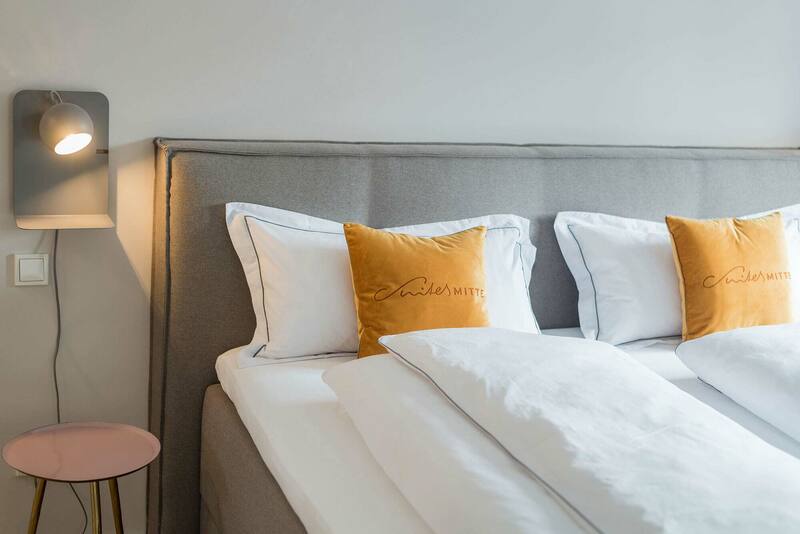 The newly built Holiday and Apartment House Suites MITTE opened in November 2018 and embodies the modern generation of accommodation when you’re on a journey. Experience the balanced mix of the flexibility of a holiday apartment and the amenities of a hotel. The apartments were designed with comfortable living, classy design and versatile service in mind and they are also accessible and energy-efficient. In the heart of Eisenach. Our apartment house is located in the heart of Eisenach in a quiet side street with parking spaces directly in the courtyard. The elevator takes you to one of the eight lovingly furnished and light-flooded 2-room apartments with south-facing balconies, each suited for 1-4 people. You can expect an exclusive experience. The oak flooring in the apartments exudes a sense of natural comfort, the large box spring beds are a place for dreams – designer furniture, floor-level showers, fully equipped kitchens in each apartment and many practical details complete the comfort concept. The service floor on the third level is available to all holiday guests. You will always find a chilled regional beer or a good wine here, but also the basics to make your own breakfast as well as books, children’s games, a washing machine and a dryer. Breakfast in pajamas? No problem, fresh bread rolls will already be there! 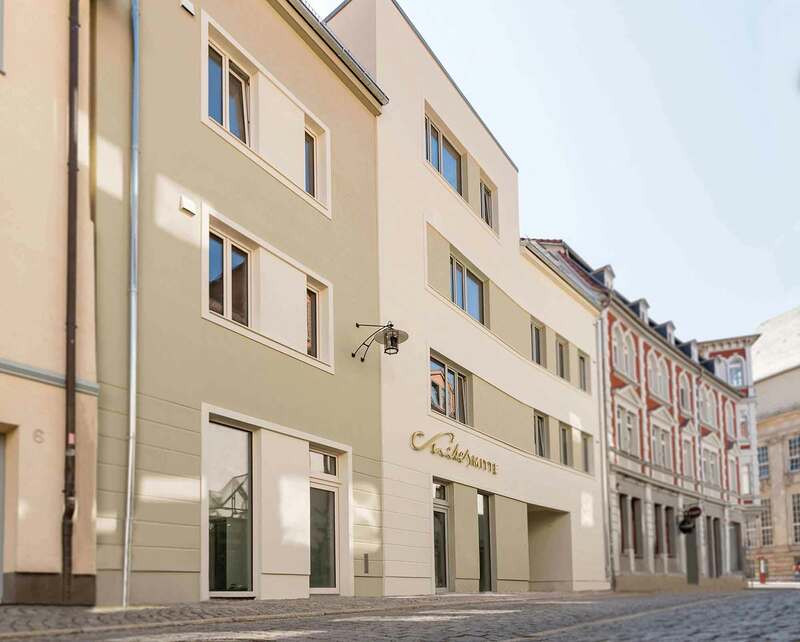 The apartments are particularly family friendly and suitable for holiday guests, city travelers or business travelers – for extended stays or for just one night in Eisenach. Welcome in the middle of Eisenach. Welcome to Suites MITTE. Wir können nur ausführen “allererste Sahne”. Hier stimmte einfach alles, vom Empfang durch das Ehepaar Setzepfandt bis zur Abreise. Solche Gastgeber kann man sich nur wünschen. Die Wohnung ist perfekt eingerichtet und liegt so zentral und doch wunderbar ruhig. Unser Fazit ebenfalls: absolut empfehlenswert. Wir waren voll und ganz zufrieden. Tolle Lage, exquisite Ausstattung mit viel Liebe zum Detail und super nette Gastgeber. Unbedingt empfehlenswert. …This is one of the best apartments to which we stayed in Europe, and we have a few dozen of them, we travel a lot. Many thanks to the owners of the hotel for the kindness and hospitality. Beste Lage im Stadtzentrum. Alle Sehenswürdigkeiten sind von hier zu Fuß zu erreichen. Unser Appartement war top ausgestattet, alles modern und stylish eingerichtet. Die Gastgeber sind super freundlich und jederzeit für Rückfragen oder ähnliches zu erreichen. Absolute Empfehlung! Each of the eight holiday apartments is a remarkable suite – Smart, Side or Select. Service is important to us – your privacy is even more important. Eisenach – Lively center for explorers and connoisseurs in the middle of Germany. Service floor with drinks, snacks etc. Our apartments are suited for people with allergies – for this reason we cannot allow pets. In addition to offering the amenities of Suites MITTE, we can draw on our decades of experience in and around our hometown of Eisenach and provide you with insider tips on nature, culture, sports and culinary experiences. So please not only enjoy the remarkable city of Eisenach and its surrounding area, but also our carefully designed apartment building with eight lovingly furnished apartments, or more precisely – your Suites! Shopping or dining, culture or leisure? SuitesMITTE brings the city to you if you like. RIGHT IN THE MIDDLE YET STILL QUIET. Your holiday apartment in the apartment house Suites MITTE is located right in the middle of Eisenach and is therefore the ideal starting point in the city at the foot of the Wartburg Castle. Various bakeries, cafes and restaurants in the immediate vicinity let you enjoy culinary experiences. Eisenach’s shopping mile, supermarkets and several service providers are only two minutes away and many of the sights in Eisenach, as well as Karlsplatz and Markt squares are also within close walking distance from your holiday apartment. The distance between your holiday apartment and Wartburg Castle is about 1.9 km so the castle is within easy walking distance. You get there even faster by car, of course. Day trips by car are easily planned, because you can park your car directly at your accommodation. No matter what time you arrive – we have enough parking spaces in the courtyard..
You can find peace and relaxation in the close-by city park and in the magnificent Kartausgarten Park. There is an indoor climbing facility just around the corner. 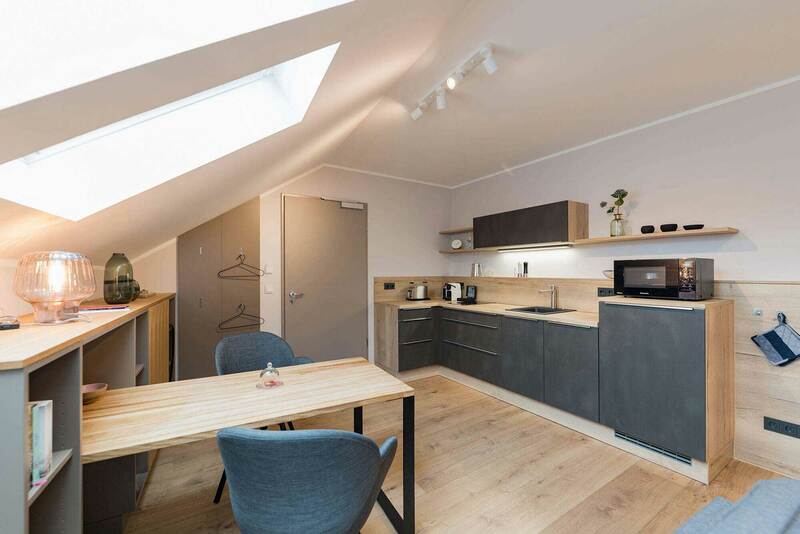 Your apartment is also the perfect starting point for city and bike tours or for exploring the villa district in the southern part of Eisenach. With its geographical location, Eisenach is a perfect starting point for holiday trips to the Thuringian Forest with the Inselsberg Mountain, the Rennsteig hiking trail or the Saalfeld Fairy Grottoes, the cities of Gotha and Erfurt or many other attractive destinations in the region.